One of the many challenges of growing and maintaining a summer garden is weed control. If you are committed to natural and organic growing practices, the challenge is even greater. As a gardener who lives in a hot climate prone to many invasive weeds, here are a few things I’ve learned along the way to keep those weeds under control. Cover the ground with a thick layer of mulch — it will go a long way in protecting your garden from weeds! It also helps to conserve moisture in the soil. Mulch consists of more than your standard wood chips purchased at the neighborhood home and garden store, though. Think creatively and use recyclable materials found around the house. Cardboard is one of my favorites. Any cardboard boxes we receive through the mail are collapsed and used to smother weedy areas. I simply wet the area I intend to mulch, lay the cardboard down on top, wet the cardboard, and weigh it down with an additional layer of mulch material (see below), scrap lumber, or concrete blocks. Thick layers of newspaper will also work in the same manner as the cardboard. Make sure to cover any “seams” as weeds and grass will take the opportunity to poke through them. Hay, straw, and grass clippings can also be piled on cardboard and newspaper in addition to, or instead of, wood chips. If you choose to use hay and straw, it is best to make sure that it is free of seeds. In my garden this is not always possible, though. Along with our flattened cardboard boxes, we use hay cut from our acreage to mulch our vegetable garden, and sometimes it does sprout unwanted weeds. But, I have found that if the mulch is thick enough, the weeds are very easily removed. If you do not have a source of hay or straw on your property, spoiled hay (moldy hay unsuitable for feeding to animals) may be obtained at a low cost or for free. Grass clippings also make a great free mulch that can be collected after mowing the lawn. Again, make sure they contain as few seeds as possible, and only use if your lawn has not been chemically treated. 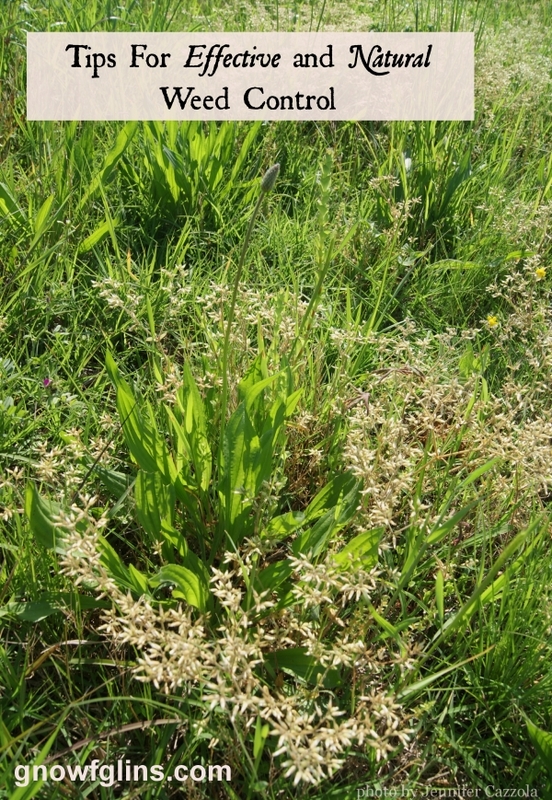 More than one application may be needed in order to fully kill the weeds. If you find that the standard household variety of vinegar is not effective enough you can upgrade to one that is 20% acetic acid. Use with caution, however! Even though this is a natural remedy it can cause injury to your eyes if it comes in contact with them. Also note that this type of vinegar is not edible so please keep it separate from the vinegar you use in your food. You can read here for more information on controlling weeds with vinegar. Many weeds, such as Lamb’s Quarters for example, are beneficial and can be used for medicinal purposes or served at the table as edibles. Others, such as clover, attract bees to your garden while adding nitrogen to the soil. 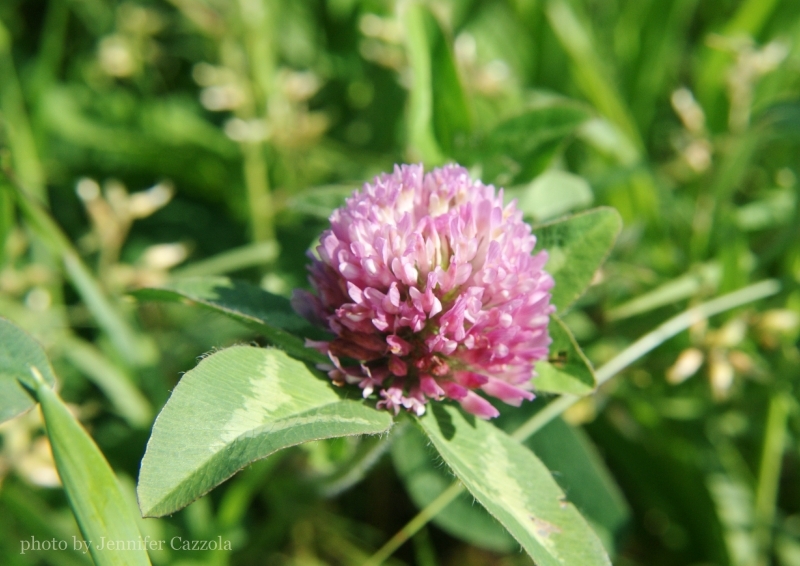 Clumps of wild clover are encouraged to grow around our vegetable garden and avoided by the lawn mower. Learn how to identify these beneficial “weeds” in your area and use them to your advantage. Like these 3 common edible weeds! Every gardener, myself included, most likely has a Pinterest inspiration board covered with an array of beautiful gardens we’d love to have. Let them go. Inspiration is wonderful but keep in mind that many of those photos of immaculate gardens were planned months in advance, staged, and possibly even created by a staff of several people. Those of us who have large gardens for the purpose of providing our families with healthy food need to find the beauty in just that. Take the approach of managing and keeping weeds under control as opposed to a completely weed-free garden. Thank you for the excellent mulch ideas. We live in a rental, and this is our first summer…I didn’t realize how many weeds we were left with when we moved in! It’s been an overwhelming task to pull weeds, and we don’t really want to invest on actual wood chip mulch since we don’t plan on staying in this home for a long time. We do have cardboard boxes that often go in the recycling, but will now be reused as mulch :). I had a big problem with slugs attacking my veggie seedlings this spring, and was wondering if putting down mulch will end up attracting slugs back to the bed? We love in Seattle, and I guess slugs are a big challenge for gardeners! Hi Prasti! I’m not sure if slugs will attract mulch or not, but there are things that can be done to deter them. If you can get a hold of some diatomaceous earth and sprinkle it around the base of your plants, that will discourage them. Be sure to use a mask when working with this stuff though. Even though it is natural, you don’t want to inhale it. Alternatively: crushed egg shells might work as well ~ basically anything sharp that they won’t want to crawl over to get to your plants. Hope that is helpful. Good luck with your gardening! Great practical advice – the newspaper trick is the one for me. Here in the tropics, weeds are very challenging. I don’t recommend using newspaper for mulch in your garden. Almost all newspapers are printed with soy-based ink today…GMO soy. So the GMOs in the ink can leach into your soil and then into your plants. Hi Amy, I can understand your concern. I personally feel that once the paper has decomposed the amount of GMO soy would be minimal. However, if minimal is still too much, then cardboard would accomplish the same task without the ink. This year…I decided to let my garden go to the weeds as an experiment. It is not beautiful to the normal person by any means but…I am getting higher yields and I do not have to water! Well maybe 1 or 2 times a month. I grow my plants 100% organic. It has been my experience that if I leave weeds in the bugs eat the weeds and not my vegetables! That’s great Amie! I’ve had to learn that productive gardens aren’t always picture perfect. Hope you continue to have a successful harvest. Did you know that vinegar in your rinse water can be used to cut soap in laundry or when washing your hair? Your not going to get added value by adding soap to your vinegar for any application unless you are trying to counteract the vinegar. Try sugar instead. Kitty the only purpose of the soap is to cause the vinegar to adhere to the leaves of the weeds. The vinegar itself does all the work. I’ve used vinegar alone in my garden (without the soap) and the mixture drips right off and is ineffective. I’ve had great results this season using the soap/vinegar spray. 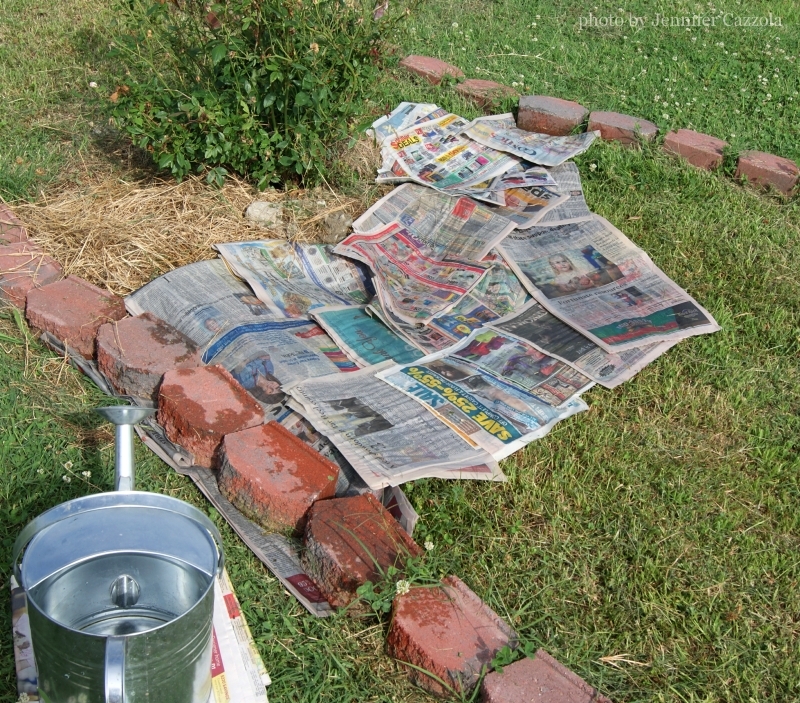 I have found the wet newspaper, ground cloth and or mulch of any kind is very effective in controlling weeds Can keep weeds away for along time, watch your seams make sure you cover all areas. I have used the homemade weed sprays of salt, dawn, vinegar and water, not as effective as Paper and mulch, homemade spray does not last as long, especially if you get a lot of rain. Just sayin! Wow, I had no idea that using mulch could help you with the weeds. As you talked about, it will go a long way in protecting your garden from the weeds. My wife and I are going to move into a new home this summer, and I want to make sure that we know how to take care of our grass. Thanks!